How can I see if a date is available? Available dates for this year & next year are published on our website and updated periodically. To inquire about a specific date, please call our sales team at 612.624.9831. Every January the McNamara Alumni Center hosts its wedding showcase! This event is especially designed for our future brides and grooms and all potential wedding clients. 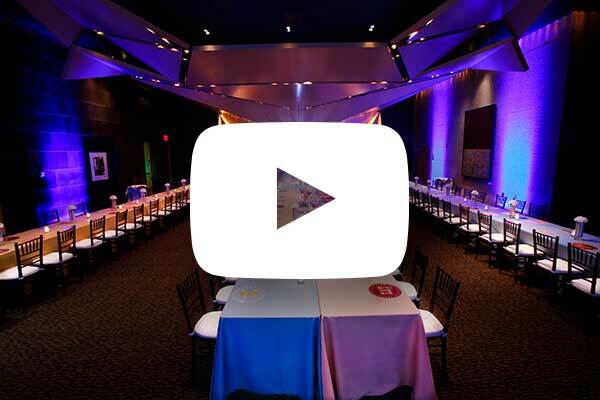 This is the perfect opportunity to see the rooms set for a typical wedding. Memorial Hall & University Hall will be set with a variety of table settings provided by area vendors. D’Amico Catering showcases menu items and specialty drinks. Look for more information on our website starting in November. Is there a U of M alumni discount? We always love seeing and welcoming back alumni into our space! Fully paid University of Minnesota Alumni Association life members of the university receive $100-$300 off their wedding package. Life members also receive a $100 gift card from D’Amico Catering. At the time of making your reservation, the person’s life membership must be paid in full. More information on this benefit can be found on the University of Minnesota Alumni Association website. Is there a Friday or Sunday night discount? Yes! We offer discounted rates for weddings held on Friday or Sunday anytime of the year. Please visit the wedding package page of our website for specific rates or call 612.624.9831. What is included with the wedding package price? All wedding packages include: up to 7 hours of room rental ending at midnight (including a separate wedding party room), dance floor, built-in stage for your DJ or band (Memorial Hall package only), custom set-up, tables and chairs, handheld wireless microphone for toasts and announcements, background music selections, and on-site event staff. The package also includes a complimentary 1 hour rehearsal the week of your wedding when your ceremony will be held at McNamara as well. What audio/visual equipment is included for ceremonies? Your officiant can choose from either a lapel microphone or a handheld wireless microphone. We include a podium and microphone for readers as well as an audio connection for ceremony music from an iPod or other digital device. Your event coordinator will work with you to determine your specific audio/visual needs. What are my options for showing a photo slide-show or video? You can rent the built-in 18,000 lumen projector and screen in Memorial Hall for $250. For the University Hall wedding package, you can rent the built-in projector and screen for $150. Your event coordinator will schedule a time to test your slideshow or video with our projector prior to the wedding day. We do allow couples to put a date on hold for no charge. If we have another client express interest in that date, you have first priority for reserving McNamara for the date or you can release the date to the other client. If you decide you would like to move forward, the deposit and signed contract would be due to confirm your reservation. I am ready to book! How do I reserve the space? We need some basic information from you to create an event contract including: names of the couple, mailing address, phone number, e-mail address, approximate guest count and ceremony time/location (if off-site). Once you receive the contract, you have one week to return the signed contract along with your $1,500 non-refundable deposit for Memorial Hall or $500 non-refundable deposit for University Hall. We accept Visa, MasterCard, American Express, and Discover or checks made payable to “University Gateway Corporation”. The remaining balance is then due one week prior to your wedding. You will be connected with an event coordinator who will work closely with you throughout the course of your planning on logistics including timeline, parking & audio-visual needs, room set-up and vendor coordination. You will most likely have 1-2 meetings on-site including a group tasting with your D’Amico Catering event planner and a final meeting the month before your wedding to go over your day-of details. One week prior to your wedding your McNamara event coordinator will send an invoice for your final balance as well as ask for your final table counts (if doing assigned seating). If your ceremony is at McNamara, you will have your rehearsal on-site sometime during the week leading up to your wedding day. McNamara also allows drop off your items (placecards, favors, décor, etc.) the day before your wedding, and then the final step is getting married! Award-winning D’Amico Catering is our exclusive, in-house caterer. Their talented event planners will work with you to create a memorable, special meal, and your food is prepared on-site. You will have a separate contract and deposit with D’Amico Catering. Their event planners are on-site and can answer all of your food and beverage questions at 612.624.9838. Food (including wedding cake), alcohol (cash & hosted bars) and non-alcoholic beverage sales apply toward the minimum. Up to 10 guests can sit at one oval table. About a week out from your wedding, your event coordinator will ask for your seating chart if you are having assigned seating. At that time, we will need to know how many tables you need as well as how many guests will be at each table. Booster seats and high chairs are also available upon request. The McNamara Alumni Center offers two beautiful centerpiece choices to complement our architecture: slate rock centerpieces and wild wire candelabras. Please visit our Items We Rent page for more information. We also encourage you to visit Recommended Vendors page for a list of vendors recommended by last year’s wedding clients. However, you can work with any licensed company of your choice. We do not allow: helium-filled balloons, non-enclosed candles, glitter, bubbles, confetti, rice, sparklers, smoke, bubble or fog machines. Nothing may be affixed to any interior walls and any items placed in the water feature must be pre-approved by your event coordinator. When will my vendors have access to the space? All wedding packages include 3-hours of set-up time prior to your guest arrival. Additional time may be requested depending on our event schedule. The McNamara Alumni Center is not responsible for items left overnight, or for lost or stolen items. Can we drop off any items such as place cards or favors early? Depending on our event schedule, we can usually accommodate a secure storage area 1-2 days out from your wedding. For couples hosting their ceremony at McNamara, it is most convenient to drop these items during the rehearsal. Is there a band green room or floral prep room? Yes. Subject to room availability, your event coordinator will be able to designate a room for your band and an area for your florist if they are making the arrangements on site. What are parking options for our guests and vendors? There are 3 public parking ramps located within two blocks of McNamara; The University Ave Ramp, the Washington Ave Ramp, and the Oak Street Ramp. The Alumni Center connects to the Washington Ave Ramp via tunnel and The Commons Hotel, the adjacent University Ave Ramp is connected directly to the Alumni Center via tunnel, and the Oak Street Ramp is a block and a half walk outdoors. Many weddings qualify for the discounted event rate ($8-$10) which is posted at the University Ave Ramp and which guests pay cash only upon entering. If you would like to pay for your guests’ parking, this can be done by making reservations ($1 fee + event rate/vehicle) which your McNamara event coordinator will do on your behalf. You can find detailed directions and a printable map of our location here to include with invitations. We also provide a 20-minute loading and unloading zone at our main entrance located at 200 Oak St SE. Nearby meters can also be reserved for vendors and/or family at $22/meter. Can we schedule a rehearsal for our ceremony? When the wedding ceremony is also held at the McNamara Alumni Center, a complimentary one-hour rehearsal may be requested for the Monday-Friday before the wedding. The McNamara Alumni Center will tentatively schedule the rehearsal at the time of the initial booking; however, due to our busy event schedule, your rehearsal may need to take place in an alternate room than your ceremony is taking place. Will you have staff onsite during our wedding? Yes. A member from our event staff will be onsite for the duration of your wedding. They will confirm the room set-up, check-in with your vendors, place directional signage, monitor microphone levels for toasts, confirm parking arrangements, and adjust lighting and room temperature as needed. It is the responsibility of your vendors and/or family members to create centerpieces, set décor, etc. D’Amico Catering will also have a banquet manager and captain on-site to assist with all food and beverage needs. Clients who cancel within 1 year prior to their wedding forfeit their deposit; clients who cancel within 4 months prior to their wedding are responsible for the remaining room rental charges; clients who cancel fewer than 4 months prior to their event forfeit total room rental charges and any applicable administrative fees up to $400. Please refer to your contract or our sales team for any additional questions pertaining to cancellation. Is D’Amico Catering the only catering option at McNamara? Yes, D’Amico Catering is the exclusive in-house caterer at McNamara Alumni Center for non-University events. What are your food and beverage minimums? The food and beverage minimum varies by room based on the month, day and time of your event. Events taking place Monday — Thursday have a food and beverage minimum of $500. Sunday nights of holiday weekends are subject to Saturday night food and beverage minimums. Exceptions may apply for short-term bookings and holiday weekends in select months as determined by D’Amico Catering and McNamara Event Management. All food and beverage purchased, including consumption from a cash bar, prior to tax and service go toward the food and beverage minimum. What is an average “per person” cost? Every event is unique. There are a variety of different things that go into the total price. Factors that affect the total price include service style (plated, buffet or family style), menu items, time frame of the event, number of guests, and labor required. We are adept at working within budgets and help guide you to the options that meet your vision AND your budget. When can we try the food? Do you offer food tastings? Once you have completed the booking process and returned the D”Amico Catering contract and required deposit you will be invited to attend one of our group tastings. What type of food does D’Amico Catering specialize in? Can your chef accommodate cultural requests? Yes. We are happy to custom-craft a menu that’s perfect for you, your guests, or the theme of your event. Do you offer gluten-free, vegetarian and vegan options? Yes. Our skilled culinary professionals have experience in vegetarian, gluten-free, and allergy-aware cooking. How many plated entrée options can we offer our guests? You may select up to 3 plated options. If you offer more than 3 entrée options there is a multiple entrée charge of $1.50 per person. Do you have a kid-friendly menu at a reduced price? Yes. We offer a children’s menu for guests 12 years old and under. Please contact an Event Planner to learn about our children’s menu. If our ceremony is at McNamara or we plan to come early, does D’Amico offer a lunch while we get ready? Champagne/beer? Yes. We can create a menu for your bridal party. This is especially popular before a wedding ceremony. We can also provide beer and champagne. No outside liquor is allowed. What are my options for bar arrangements? We are flexible in arranging open bar and cash bar combinations suitable to every budget. Several options are available, including hosted and cash bar. Please discuss your wishes with your Event Planner. We will tailor alcohol service to meet your needs including alcohol preferences, but pricing may vary depending on the brand. Also, a $150 bar minimum fee is only applied to events where the sales at that bar did not reach $500. Can I bring in my own wine or alcohol? No, D’Amico Catering holds the liquor license and insurance and is responsible for all liquor served on the premises. For this reason we do not allow any outside alcohol. If you have a special request let us know and we will try to accommodate you. Can I bring in my own cake? Does D’Amico Catering make wedding cakes? D’Amico Catering does offer delicious wedding cakes. We highly recommend that you try our cakes at your group tasting before making your final decision. If you have something special in mind please ask. Otherwise, we do allow outside vendors for wedding cake, from a licensed bakery for a fee of $2.25 per person. Who is the point person during the wedding? You will be assigned a D’Amico Catering Event Supervisor to manage your event. He or she will be available to you for the entirety of your wedding celebration to ensure everything goes exactly as you planned. How long before my wedding do I need to confirm my final guest count? When is my final payment due? A $2500 deposit is required for all weddings. Then five business days before your event you call and finalize/guarantee your guest count. We then send you a Pre-function Estimate based on these final numbers, which you will sign and return with your prepayment. You can pay with a credit card or cashier’s check. What does your (23%) service charge include? The 23% service charge is used to cover the labor and administration costs required for the planning and execution of your event. The service charge is not a gratuity and is subject to state and local tax laws. What décor items does D’Amico offer? D’Amico Catering provides at no additional charge: linens from our inventory, china, flatware, votive candles, hand-pinned skirting for food and beverage tables and all serving pieces. You may upgrade your table linens to floor length for an additional charge of $15 per dining table. McNamara also rents candelabra, fire pits and other items. Please see their Item We Rent page of the website. Is a gratuity included in your invoice? Gratuities, while greatly appreciated, are not required nor are they expected. Should you choose to leave a gratuity for exceptional service, please speak to your Event Planner. If you are a U of M Alumni Association Lifetime Member you will receive a $100 gift card to any D’Amico restaurant. Before a gift card is mailed we confirm your membership with the Alumni Association. A U of M police officer is required for all weddings serving alcohol. We coordinate scheduling an officer and the charge will be added to your Event Order. They require a minimum of a 3 hour shift. Are there any other fees I might be charged? There are no other catering fees besides those addressed in the questions above. When we provide your personalized proposal, we list all of our estimated charges in order to provide you with a complete proposal. In addition to the menu pricing, we list the service charge, sales tax (state and local at 7.775% on food and 10.275% on liquor), security (if liquor is served) and pricing for any rental upgrades.